L 22″ (56 cm) W 54″ (137 cm). Call is similar to that of the Herring Gull. Description: Sexes similar. 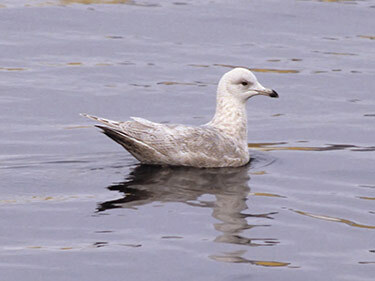 Breeding adult has white primary tips usually with gray above; pale gray mantle and white underparts; yellow bill with red spot; most show yellow eyes; and pink legs. 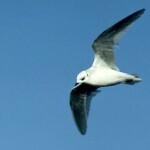 Winter adult is similar to breeding but with brown streaking on head and breast. Second winter birds are almost entirely white except for a gray back; pale eyes; and a two-toned bill. First winter birds are buffy to mostly white; bill is black and short; and dark eyes. 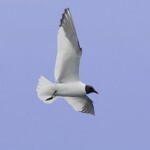 Habitat: Nests on cliffs along the east coast, seen most often in the winter at garbage dumps, sewer outlets, and fishing piers. Where in Nebraska: Accidental. Seen in Keith County in 1994. Fun Facts: In summer, the Iceland Gull times its breeding cycle with the melting of the sea ice, and forages where ice and water meet. 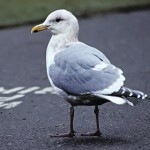 Additional Information: “Glaucoides” comes from a greek name meaning “resembling the Glaucous Gull”.